Last year when a group came to visit Glen Villa, I asked them what I could do to make a future visit more enjoyable. Provide a map, they said. So I have. A very kind friend has revised the map of Glen Villa produced in 2007 to bring it in line with what is on the ground today. Here is the version from 2007. This wonderfully hand-drawn map of Glen Villa dates from 2007. This is the 2014 version. Differences are subtle, but substantial. At first glance the two maps may look the same. But they aren’t. Some of the differences are in the way information is presented: the numbers that refer to different features started at the road in the 2007 map, and now the numbers start from the cascade near the house. The dotted red line that indicates the route through the garden has changed as well. The biggest changes are the features added in the last seven years, and these don’t appear on the new map. The Aqueduct is the biggest addition to the garden proper. Readers who were following this blog last summer will be familiar with the headaches this project caused in the making. I’m delighted to say that is working well now, and provides pleasure every day. The harsh orange will soften over the next few months. The juniper on the bank is spreading nicely. Other additions are more subtle. The deer fences I designed and installed last summer aren’t shown on the new map, although I wish they were. 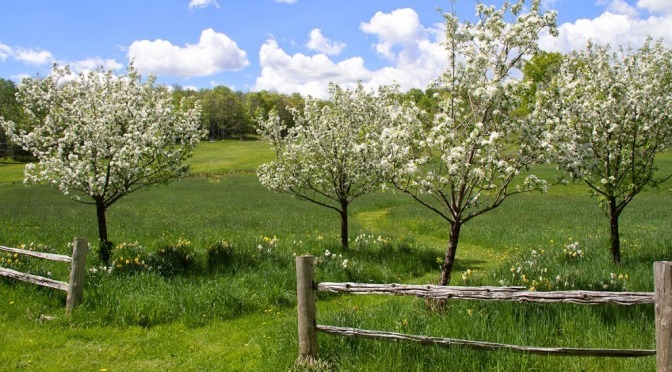 In terms of vegetation, these fences are significant. Shrub borders that used to look like this…..
Nice autumn colours in this photo, but not much else of interest. now look like this. What the deer can’t reach finally has a chance to grow. This is one of two enclosed areas in the Upper Field. 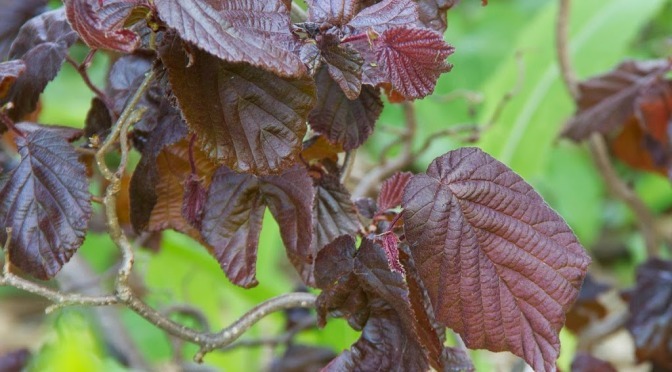 The shrubs need a few years to grow to full size and should look wonderful when they do. The fences in the Asian Meadow are also working wonders, but in different ways. 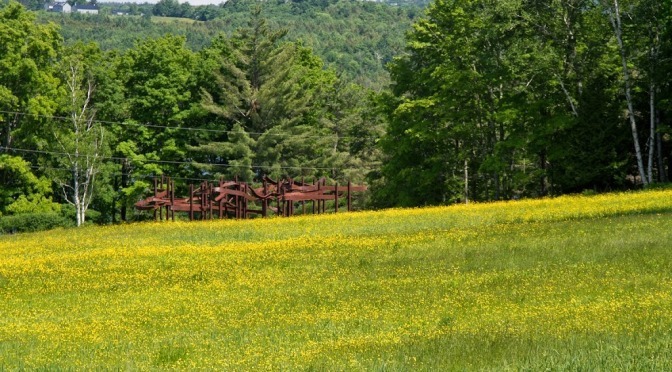 The material echoes the rusted metal of Bridge Ascending, the large sculpture that stands in the adjacent field, while the shape mimics the zigzag fence that surrounds the picnic area. The deer fences add structure to the open meadow. I installed the fences to protect shrubs from the deer, and they perform that task very nicely. They also corral plants the deer don’t like, such as these allium that poked their heads up in mid-June. I plan to add more allium, so that the flower heads will float from inside the fences to the grassy meadow beyond. I’ll remove the iris I planted inside the fences: by the time they bloomed, the grass hid them completely. The biggest changes in the years between the two maps, though, are the art installations I’ve created. The first was Webster’s Column, a tribute to my husband when he retired after 50 years as a journalist. During those years he was a reporter, editor, and, for many years, a columnist. So a column filled with newspapers seemed appropriate. The column sits on a granite base inscribed with names of places from which he reported. On the stainless steel are quotations about journalists (rarely favourable) and about journalism in general. 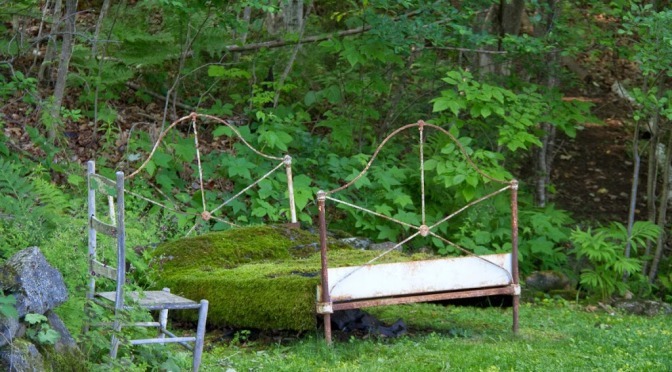 Abenaki Walking and In Transit/En Route are two art installations that respond to a shift in my own interests, from gardening to larger, more conceptual ideas about landscape. Increasingly, I’m exploring how history and the passage of time affect the land and the people who live on it. The Abenaki believe the world was created on the back of a turtle. The post on the turtle’s back represents chaos, or the time before creation. through the arrival of European settlers…. by fences and barbed wire after European settlers arrived. The post on the right shows the affect of disease: it is painted with the smallpox bacillus that killed so many. This part of the installation is called Ghost Walk, since few Abenaki survive today. I am leaving the bundles to rot gradually. In Transit/En Route explores ideas about aging and the passage of time. Like Abenaki Walking, this installation covers a lot of ground, both literally and metaphorically. Signs posted along a trail through the forest offer views onto the landscape and ask questions that may be easy to answer but difficult to read. French and English phrases are run-on, making the questions difficult to decipher. And that’s the point: to slow you down. And are the questions really easy to answer? Not for me. The clearing at the end of the path is a sundial; the shadow of a dead tree marks the hours. The shadow falls on a post. Count the red lines to determine what time it was when I took this photo. Perhaps the most significant indication of my change in direction is this sculpture, Coup de Foudre. It was made last year for a client whose house, struck by lightning, burned to the ground. He and his family love this area and come here regularly although they live in California, thousands of kilometres away. They rebuilt their house and commissioned this piece, whose title has a double meaning: coup de foudre means love at first sight, but it also refers to a lightning bolt. That’s how I feel about Glen Villa, about the art I’m creating and the work I’ve been doing on the land over these last seven years. I feel as if I’ve been struck with lightning, energized, given new chances to do new things. And there’s no question about the results. I am deep in love with every moment of it. Identifying spring wildflowers: why bother?